We are soooo excited to share this amazing news. 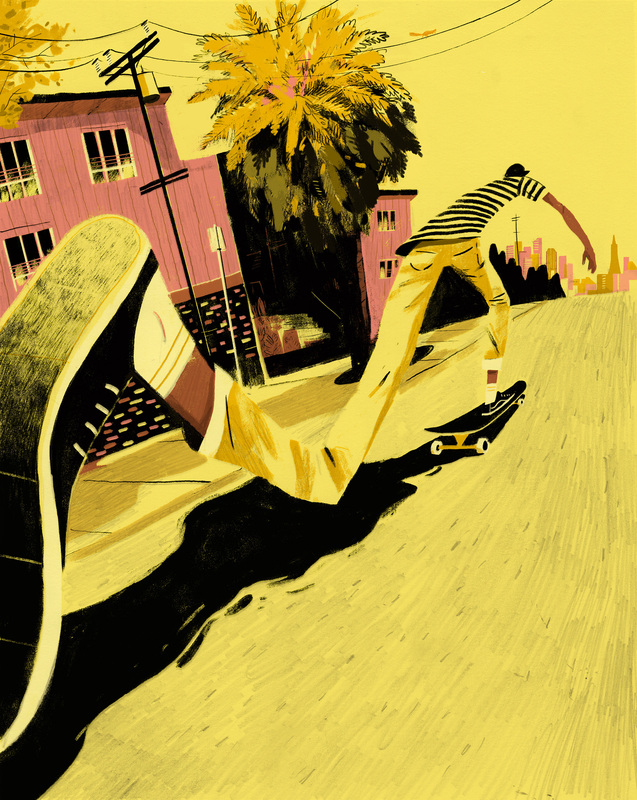 RYAN JOHNSON received a call yesterday from the Society of Illustrators that he received a SILVER MEDAL for his artwork “Goofy Footed.” This is an artists dream to receive such a medal. We are so incredibly proud of you Ryan! Just goes to show you all that hard work does have it’s pay-offs. We know that you are drowning in work right now (which is a good thing) and likely it hasn’t sunk in, but CONGRATULATIONS on your amazing achievement, we are so incredibly proud of you!!!!! Please join me in watching Ryan accept his medal at the SI opening show on January 11, 2019. Artwork in the Advertising category are works created to sell a product, such as consumer ads, billboards, theater posters, and point-of-purchase. Gold medals are awarded to Cinyee Chiu for The Freedom Fund’s Hotspot Model (Client: The Freedom Fund),Victo Ngai for #BloodNormal (Client: Libresse Sverige, AD: Edwina Dennison), and David Plunkert for Theatre Project 2017 – 2018 Poster Series (Client: Theatre Project). Silver medals are awarded to Melinda Beck for A is For Presents Broadway Acts for Women (Client: A is For), Leslie Herman for Get Out (Client: Waxwork Records, AD: Suzy Soto and Kevin Bergeron), and Rebecca Mock for Rise (Client: WeWork, AD: Rhiannon Sawyer). The Institutional category includes work commissioned by an institution such as government services, in-house, or a corporation. Gold medals are awarded to Esther Goh for 6 Ways We Could Hurt Ourselves At Playgrounds (Client: National Museum of Singapore, AD: Lim Shu Min), Lily Padula for Maladaptive Daydreaming (Client: NPR, AD: Meredith Rizzo), and Sonia Pulido for Merce 2018 (Client: Barcelona Town Council, Spain, AD: Workshop + Julia Solans). Silver medals are awarded to Elda Silvana Broglio for Lead by Example (Client: Texas A&M Foundation, AD: Edla Broglio), Victor Juhasz for USMC 26 MEU Training Exercises (Client: National Museum of the Marine Corps), and William Low for Rosewood Hong Kong (Client: New World Development Company, AD: Tony Chi). The Surface/ Product Design category, which features work used on merchandise such as carpets, pillows, rugs, clothing etc., and can include repeat patterns seen on wrapping paper, wallpaper and other various textiles. Gold medals are awarded to Joseph Veazey for Adult Swim Commemorative Plate (Client: Adult Swim, AD: Jacob), Amber Vittoria for Say Beautiful Candle (Client: Otherland, AD: Red Antler), and Olimpia Zagnoli for Oz Fever (Client: Marella). Silver medals are awarded to Josh Cochran for West Village Queue (Client: Shake Shack, AD: Nirali Parikh), Alix Pentecost Farren for Sleepers, and Toma Vagner for Five Games (Client: Vinyl Moon, AD: Brandon Bogajewicz). Uncommissioned pieces include all self-generated work such as portfolio samples. Gold medals are awarded to Makoto Funatsu for MOMENT, Andrea Caballero Salcido for Celebrando la vida, and Gary Taxali for NO. Silver medals are awarded to Alice Yu Deng for A Balcony with Plants, Ryan Floyd Johnson for Goofy Footed, and Taili Wu for Portal #1: Poolside. An Opening Reception and Awards Ceremony will take place on Friday, January 11th.